Let me guess! 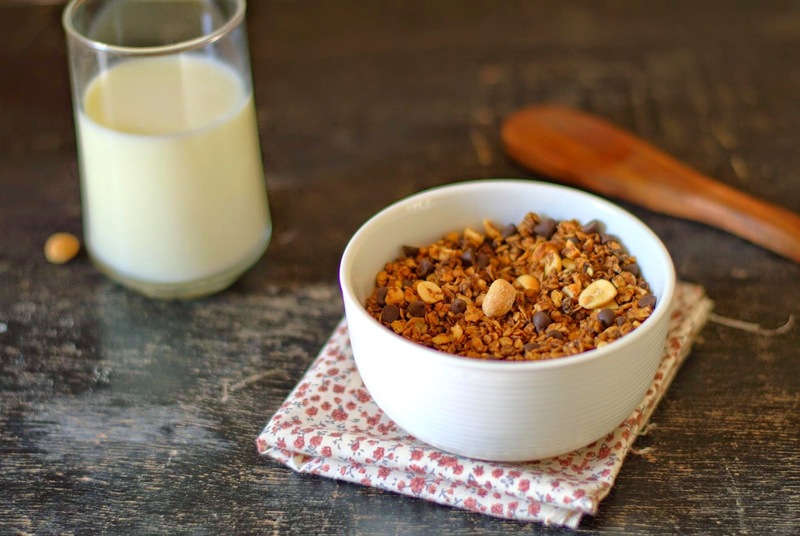 With zillions of granola recipes out there, you can't really believe that I come back with another granola recipe with chocolate! If you could see me I look suitably sheepish agreeing that the other two here are Chocolate And Coconut Granola and Double Chocolate Granola. Please don't look at me like that, this one has peanut butter too! With raving fans of the spread around, I thought David Lebovitz's Peanut Butter And Chocolate Granola.will be a good one to have in the jar. Like when I want to make peanut Butter Granola. I sneak out and buy some peanut butter and pretend it was there all along, somehow went unnoticed. I like having some granola around to feed the incorrigibly sweet -toothed me. Not to forget my forever hungry pre-teen who keeps combing through the kitchen for a 'small sweet something'. Sweetish, slightly salty, with chocolate and peanuts in each spoonful, it's a peanut butter lover's healthy treat! This makes a small batch of granola of about 1 1/4 cups you could bake in the 12'' round tin of your microwave. Can be easily doubled or tripled to make more.if using a much larger tray. Method : Pre-heat oven to 160 degrees C / 325 F. Line your baking tray with parchment. I have used 11 '' round tin. In a large bowl, mix together the oats, chocolate chips and the peanuts. Take the peanut butter, honey, sugar and water in a small saucepan. Heat, stirring constantly, to warm the mixture. Do not let it get too hot or start boiling. Scrape the peanut butter mixture on the oats mixture. Mix well with a spatula. You will have a slightly wet but crumbly mixture. Transfer to the baking sheet, spread evenly in a thin single layer. Bake for about 15 minutes. Stir to redistribute (don't forget to stir from the edges cautions David). Bake again for 5-8 minutes. The baking time varies depending on your oven and the thickness of the granola spread in the pan. Be careful. If in doubt, bake less. You can always bake more if needed. If the chocolate chips melt, your granola will be kind of muddy looking like mine, so hard to judge by the color. It will still feel soft but will turn crunchy as it cools. If you want it crunchier, bake 2-3 minutes more. Be careful not to over-bake as it will start smelling burnt. Don't know about you, but I would prefer my granola a little less crunchy to slightly burnt. Once completely cool, store airtight. Keeps for a month or more - only if you make a considerably mega batch! Oats : I sieve the oats in a colander to get only the largish flakes and use them for the granola. Reserve the powdery part for another use. Peanuts : I have used ready shelled, roasted and salted peanuts. You may want to omit or reduce salt according to the kind of nuts you use. Chocolate chips : I have used the kind used for baking. But it started to melt when mixed with the warm peanut butter. Not that I have any complaints with the taste, but if you want the chips intact, you could try waiting for the PB mixture to cool a bit before adding it to the oats mixture. 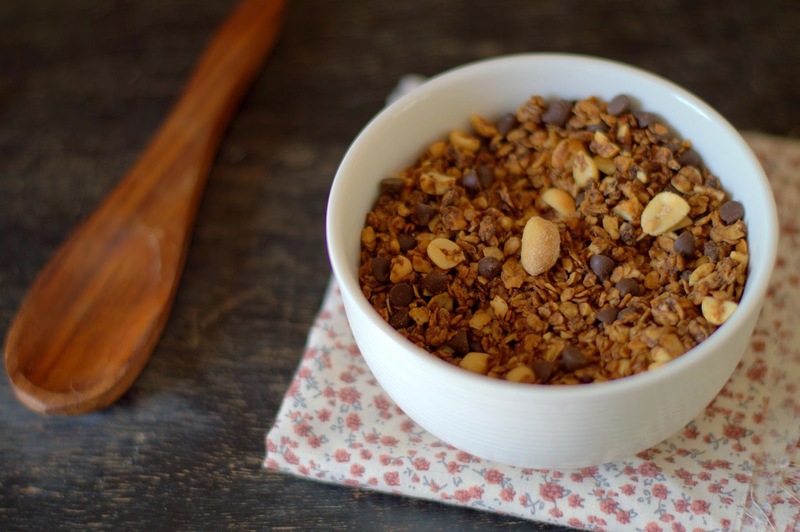 Granola is my weakness, cant take my eyes from that bowl of granola.